While browsing the blogs of various colleagues, I ran into an interesting note from Céline Graciet mentioning her use of a free fax to e-mail service as part of a planned move to the UK. I followed the link out of curiosity and decided to give it a try. Signing up took a few minutes, then I was give a local telephone number to use for receiving faxes. However, the web page that communicated this information didn't say where it was local. My best guess was somewhere in the UK, so I tried faxing from my real landline fax number, adding the +44 prefix to the number from the web page. It worked. In just a few minutes I could see TIFF files for the faxes on the account area on the web site. A few minutes later I received copies of the faxes as e-mail attachments. I haven't looked into the security issues with the site yet; I'll probably be appalled when I do. Maybe not. It's an interesting application and one for which I can see some integration possibilities with other applications I use, such as LSP.net's Online Translation Manager. I can see this being useful when I'm travelling or to save me the trouble of re-scanning faxes for OCR purposes. I used to use a fax modem many years ago for similar reasons, but faxes have become such a rare thing in my business over the past decade that I haven't bothered about such solutions in a long time. This overview shows the behavior of the Java properties file filter in memoQ version 4.2.20 and how to configure and work with it to manage projects with a small or large number of files successfully. In the current version of memoQ (unlike Déjà Vu, for example), the output format must be selected when applying the import filter. It is currently not possible to change the output encoding "on the fly". 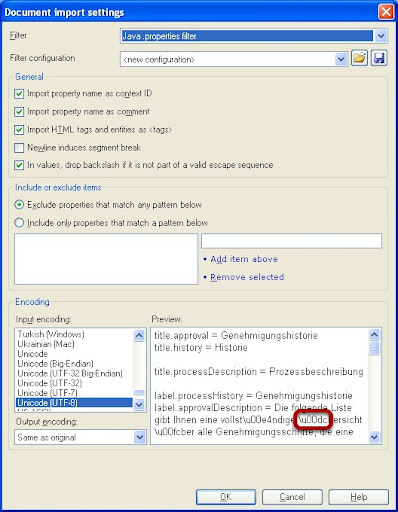 The current default settings for the filter will often not lead to the desired result, which is an output file with the same escape coding found in the original properties file. (An example for the German letter "Ü" is marked with a red box.) An example of the output with these default settings is show below. This looks good, but it's useless. The file would have to be converted using an external utility like the Rainbow tools. The problem here is that the wrong output format is used for the translated file. The proper settings are show below. This screenshot actually specifies the input encoding incorrectly (it's an ANSI file I'm importing), but that doesn't matter in this case. because the preview displays the input text correctly. The important thing here is that the output is set to US ASCII, which forces the Unicode escape coding for all the "special" characters used in the language (i.e. those which are beyond the character set of US ASCII). The example above shows the text as it is required in a Java properties file using escape coding. The same procedure applies to other languages, such as Greek. The memoQ translation and editing enviroment displays these escaped characters in a proper, readable format which allows you to work on the translation without undue stress. 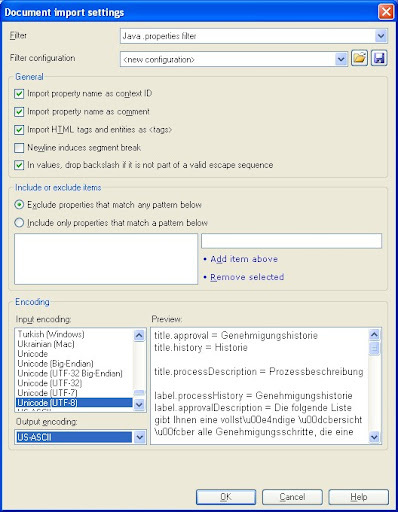 Examples of the view in the various memoQ environments and bilingual output formats are show below. Here all the escaped characters are displayed in a legible manner as they should be. Conversion to escaped ASCII text occurs only when the translation is exported as a Java properties file. The Trados-compatible bilingual format from memoQ allows the content to be translated using the TWB macros of Trados Classic or using other tools such as Wordfast Classic or Anaphraseus. Here the text is also displayed in a legible format for working. Tags are displayed in red and must not be altered by the translator. This view is also interesting because it incorporates the memoQ comment fields, which in the case of a Java properties file contains the key of the key/value pair. This is useful context if you need to ask questions of the programmers. Why online translation business management? This coming October it will be my pleasure to make a very short joint presentation with another colleague at the ProZ conference in Prague. The subject will be online translation management and a brief review of key features and issues to consider. The outline for the talk is somewhat challenging to develop, as the allocated time is thirty minutes, and this is a subject that could be discussed for hours without exhausting it, particularly if one begins to compare all the myriad online and offline options with each other. For the sake of “full disclosure”, I'll remind the reader that I do now have a formal business association with a company providing such solutions: LSP.net. I'm technically on the payroll of an affiliated company, which simplifies my life by handling my backoffice functions and remembering to pay my health insurance, and as part of the arrangement I handle updates and many improvements to the English interfaces of the Online Translation Manager (OTM) as well as write occasional tips on how to use the system. I support that solution because I believe that this type of service is of great potential value to many of those with whom I have professional contact in the language industry. Here I mean online solutions of one sort or another, not necessarily the particular one I support because it fits my needs. What led me personally to move from “offline” solutions – some of them very, very good – to online management tools for my translation business? Many people with businesses more complex than mine get by somehow with souped-up Excel spreadsheets or an Access database on steroids and a LAN. Tools like the Translation Office Manager (TOM) are network-enabled and do a great job even for agencies that have outgrown the kitchen table. a better “filing solution” was needed for compliance with the legal requirements for retaining project-relevant documents such as e-mail, NDAs, master agreements, etc. Points 5 through 7 really only can be dealt with via an online solution of some kind. Whether that solution is a VPN, SaaS or something else is secondary. The third point also required an online solution particularly when the parties involved are often not at the same location or hiring a remote assistant is considered. There were other criteria to consider, such as workflow design and customizability where I was willing to consider some compromises, at least temporarily, but those eight points were my personal list of features that must be available to me in order to achieve the desired changes in my business. Much of the list had long since been satisfied by my desktop solutions from LTC and AIT, but the real stumbling block time and again came down to online multi-user access, data security and, in the end, cost and infrastructure issues as well. Three times in the last five years I have had cost estimates put together for an in-house server for our two-person office. Each time, however, I put off the decision to buy. In one case I simply didn't have the cash for the whole complex system that was proposed, and later when prices fell dramatically I was simply irritated by a line item of 150 euros per workstation to “connect” to the server (i.e. plug in a simple cable to the RJ-45 sockets built into the walls of the office for a network years ago). Really, though, the biggest issue for me was the lousy feeling in my gut at the thought of having to maintain yet another piece of hardware (and all the associated software) in the office. I've been fiddling with IT hardware and software for too many years now and I'm simply sick of it. I want to do things I really enjoy now like translate interesting texts or work with my dogs. So for me, the software as a service (SaaS) model is attractive for translation business management as well as for other applications I use like translation environments. If Kilgray were to offer an attractive SaaS package for using the memoQ Server (so I wouldn't have to mess with the supporting hardware), I would probably jump on it. As I did with the Online Translation Manager from LSP.net. To some extent my chosen solution is like hunting rabbits with a cannon loaded with grapeshot, but I prefer to have more features than I need and have the option of growing without changing systems than to meet a very limited set of requirements well and have no further possibilities in the chosen framework. That was why, years ago, I chose the agency version of LTC desktop software, and the few times I needed to outsource to the few people I trusted not to screw up I was glad of the additional flexibility with provider records and price lists. Nonetheless I think this will be an area to watch in our profession; the potential value to many of us is high, and the existing solutions for software as a service will develop further as others come online. That will be good for all of us I think.